During fall in Michigan, you can see some of the best autumn colors in the country. The trick to seeing them is to time your walk, drive, or train tour to hit the height of fall colors. For leaf peepers wanting to get the most out of fall foliage, find out when and where to be in Michigan in fall. Leaves change color as the result of the changing ratio of three pigments: chlorophyll, carotenoids, and anthocyanins. The production of each pigment is in turn affected by several factors. The main factor that triggers the color-changing process in the fall is diminishing daylight. Tree species, temperature, rainfall, and soil moisture can also affect pigment production and therefore leaf color and vibrancy. For example, the red tones (determined by the production of anthocyanins) are the colors most affected by weather conditions. Generally speaking, peak fall foliage in Michigan can range from mid-September through the end of October. As might be expected, the Upper Peninsula reaches peak fall color before the rest of the state, although there are some exceptions. The metropolitan Detroit area tends to host a full range of colors in mid- to late October. Several resources make predictions, much like a daily weather or allergy forecast, about when leaves will change color in Michigan. They also keep track of the color-changing progress at various locations throughout the state, including the Detroit area. The Weather Channel posts a map of current fall-foliage conditions in the region. Pure Michigan (Michigan's official travel and tourism site) posts a map with a prediction of color-change peaks across the state. 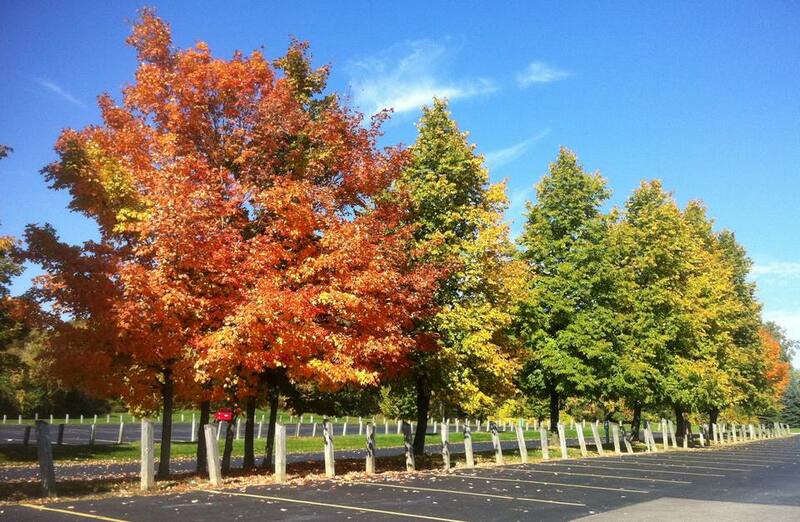 The Foliage Network provides reports for the Midwest that keep track of color and leaf drop. In much of Michigan, including the southeast and metro Detroit, viewing its vibrant fall foliage may require nothing more than stepping outside; but if you want to get the most out of fall in Michigan, consider taking a tour. Michigan's Gold Coast rates as one of Travel and Leisure magazine's "America's Best Color Drives." The route starts in Traverse City. It then meanders 100 miles through Northport, Inspiration Point, and Sleeping Bear Dunes National Lakeshore. Meanwhile, The Travel Channel recommends the Lake Superior Circle Route in the Midwest for excellent fall foliage. The route includes stretches not only in Michigan but also Wisconsin, Minnesota, and Ontario, Canada. If you want to see fall foliage closer to Detroit, check out "True Colors: Detroit’s Fall Tour Guide" by Robert K. Jones. This book provides readers with basic information about Detroit’s trees and leaves in the fall. Driving is, of course, a good way to see Michigan's fall colors, but taking a train gives you time for observation and is an experience in and of itself. The Michigan Steam Train schedules train trips to catch peak color change. Routes vary and can cover Kalkaska, Petoskey, Boyne, Cadillac, Clair, Lake George, Mt. Pleasant, Owosso, and Yuma. The Southern Michigan Railroad offers a train ride that departs from Clinton. It lasts 45 minutes to an hour. If you are considering other Midwest states for tours, check out Train Traveling, which posts a list of train rides in every state.